Her statements about it might have sent me reeling a few years ago. Since becoming a father and living my life in a consistent and orderly way for the last 11 years, I can think I understand her meaning. 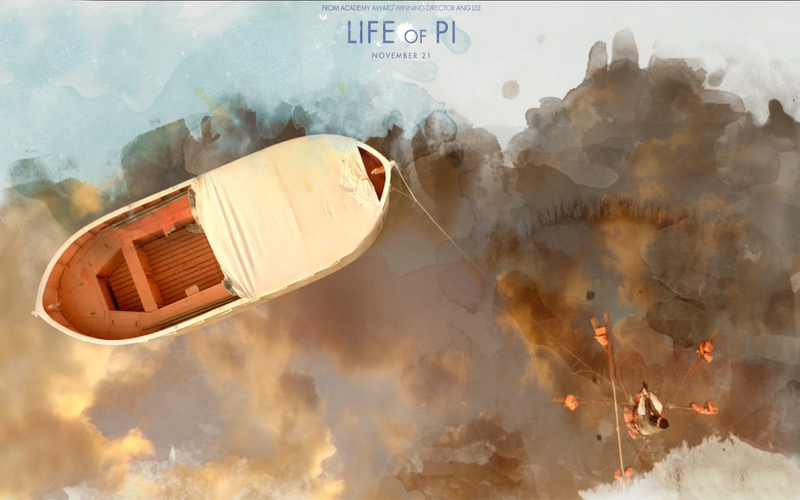 Much of this Life of Pi is as beautiful as anything I have seen, at least since last year’s Hugo. The story of a young boy’s journey to get to know God has an eye for the details, without being caught by the devil. His journey takes him to three seemingly disparate religions: Catholicism, Hinduism and Islam. Before he is dragged into the darkness of his father’s warning, he has applied all the best parts of these philosophies and is living a journey towards adulthood. Then comes a boat ride that changes his life. Part way through this journey, over the deepest part of the Pacific Ocean, the ship goes down. Somehow he ends up adrift on a life boat with 4 animals. Soon enough, the animals number just one, a tiger named Richard Parker. What follows is an amazing visual journey, which, by legend, is much deeper when you read the book. I am okay with the story on the surface, though. However improbable, it is enthralling and quite well acted by Pi as a young man (Sharma) and tiger (four of them, and their digital counterpart). The feeling imparted cannot be described accurately as well as one might wish. It’s somewhere between viewing a living painting and a lucid dream. What it means is open to interpretation…or not. In the present day, we have the adult Pi (Khan) patiently explaining his story to a bookish and somewhat annoying writer (seemingly the author himself, as portrayed by Spall). The writer, through some narrative necessity, has burdened Pi with the responsibility of not only spilling the beans on his amazing boat trip, but also with convincing him of God’s existence. Pi seems nonplussed with this imperative, but he goes forward with his tale regardless. The beautiful part of this is that the viewer can tell the story’s effect on the storyteller. When he says “Yes, we will get there,” one cannot help but realize that he knows it’s not up to him to convince the writer. His journey has already led Pi to the reassurance he needs. It’s up to the author to make the leap. Back at sea, on the boat and its accompanying raft, we see some wonderful things, without necessarily getting caught up in the burning sun that our heroes are exposed to. Lee is an incredible visual director, whose sense of narration sometimes takes a back seat. Viewers are okay with this, because the sights are wonders to behold almost entirely throughout. In order to bring us more fully through the sense of starvation and true introspection, one would have to move at the deliberate pace of, say, Clint Eastwood’s opus, Unforgiven. Lee would have lost a lot of the viewers if he had done this. So in the end, when we see the tiger and Pi at their most emaciated, it comes off as a bit of a surprise. We don’t see much of this starving, and most movie viewers would not want to. 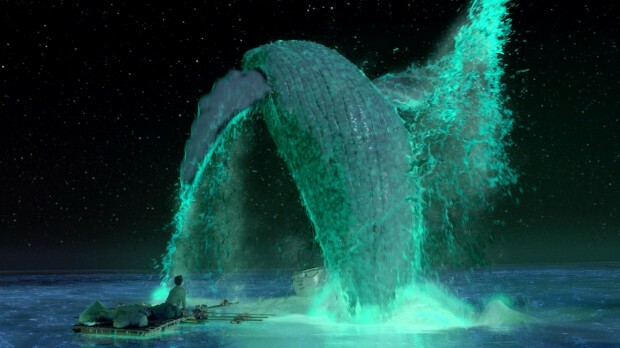 Other weaknesses of the plot that the film can’t quite resolve is the presence of four rather large mammals on a life raft for several hours. The excuse given is that they are drugged, and therefore unable to gather their footing. Seeing a hyena spend a few hours unable to make the leap to a tarp wrapped over half a boat is one thing. When the next day arrives and the tiger has taken over and he can’t make that jump, one has to balk. Anyone who has seen a cat balance on the back of a recliner without flipping off could not give the willing suspension of disbelief required. That’s not what the book is about, one would suspect. And if we buy the ending of the tale, neither would a couple of Japanese insurance agents, unless the other story is more boring, harsher and typically human. Is it possible to find religion in this film? Are the sights seen enough to turn a skeptic into a believer? Is the trip we take on this small boat worth the ambiguous ending? That is for the viewer to decide. This viewer is ready to float with the tiger again, even if he doesn’t care to wonder what the jumping whale means. Even if we’re floating in the shallow end of the pool, it’s a beautiful ride.